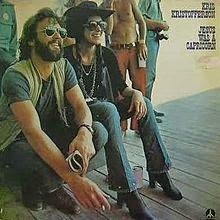 Jesus Was A Capricorn was Kris Kristofferson's second album release of 1972. It presented a collection of ten new songs in his distinctive story-telling style. By this time he was in a relationship with singer Rita Coolidge, and one of the songs he performed as a duet with her. Another guest vocalist was singer-songwriter Larry Gatlin, who sang his own "Help Me" with Kristofferson (the one non-original song on the album). With a similar spiritual theme was "Why Me", which was released as single and became a big hit, reaching #1 on the country chart and #16 on the Billboard Hot 100. It turned out to be the one and only #1 hit of Kristofferson's career, and the album marked the high point for him in terms of commercial success - his subsequent albums would all sell in increasingly smaller quantities. FYI-The 8th Track should correctly be "Out of Mind, Out of Sight". I love Rita Coolidge's contributions on this one. Great and timeless music. Thanks you. do you have bob darin - commitment? any long ryders or coal porters on hand?